Day two of the PPAI expo is in the books! Day one had a ton of great new and exciting products and day two didn’t disappoint either. Check out some of our favorites from day two below. Journals have been a trending item for the past few years. This year it’s the design of the journals that’s making the biggest impact. We’re now able to do a debossed design edge-to-edge on journal covers with the Bohemian Textured Journal. This is a great way to increase the perceived value of a giveaway and it also boosts the retail look. 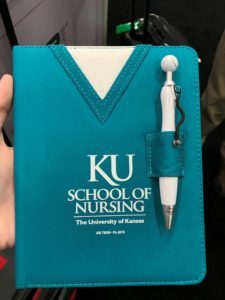 The other journal we loved this year was the Swanky scrubs Junior Writing Pad. These will make for great giveaways for medical schools and nursing programs, doctors and dentists offices and more. 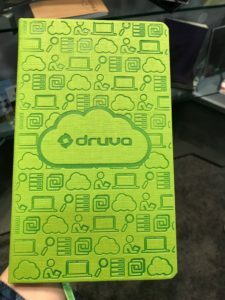 Don’t just give away any promotional product with your logo on it, hand out a journal that shows what you do, before the recipient even sees the logo. Drinkware is always a hot category at the PPAI Expo. In past years we’ve told you about the popular trend of mirroring the look of retail drinkware in the promotional product market, such as the Yeti and S’well bottles. This year has been no different. The newest spin on this trend is taking high-end, metal retail pieces and giving them a lower price point by making them from plastic. Our favorite piece so far this year is a new spin on the Yeti style tumbler, known as the Sentinel Tumbler. 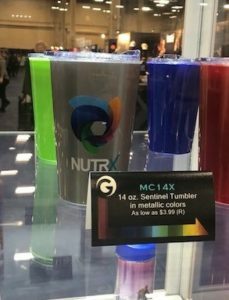 The Sentinel has the same look as a Yeti tumbler, but instead of being a traditional metal style tumbler, it is made of plastic, making it more affordable for many buyers at around $4.00 each. It comes in a great painted finish, and includes a plastic sealing top. We’ve also seen this trend with other retail-like bottle styles, including the S’well, and other Yeti shapes and styles. The best part of promotional products are that they are fun! What better way to take advantage of that feature than to give a promotional product that screams fun, just by looking at it? One of our favorite finds this year was a promotional version of Jenga. The best part of this version, is that you’re not just limited to printing on only the box, as many versions of the game allow. At no additional charge, you can imprint on each and every block. This gives you the opportunity to take your message to the next level. You can share your company message, core values, corporate mission, branding and more. The opportunities are endless! Plus, who doesn’t love receiving a fun game that you can play with your friends and family? Want to take on a different game? We saw cribbage, dominoes, mini bag-toss and more.